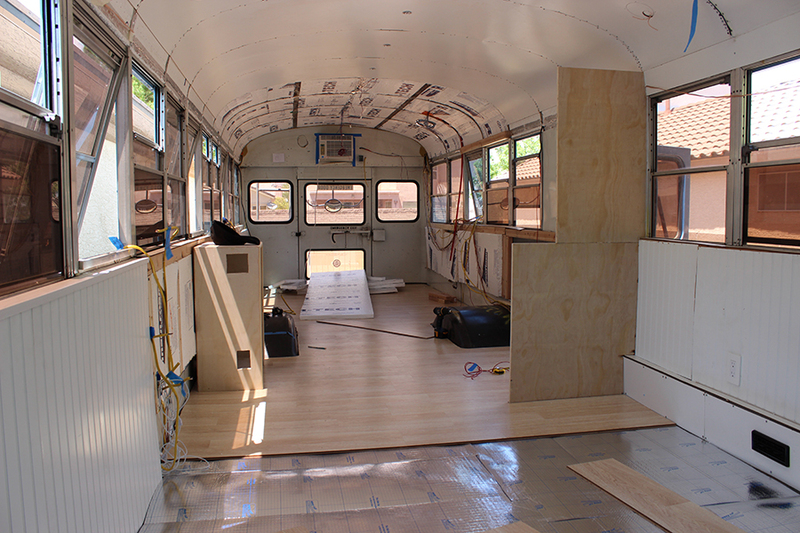 I would love to share with you how we laid out the bus! Thank you for asking and welcome to the Bus Life! I don't have a legitimate design of the layout, so here are two videos of the interior and an explanation of why we did what we did. 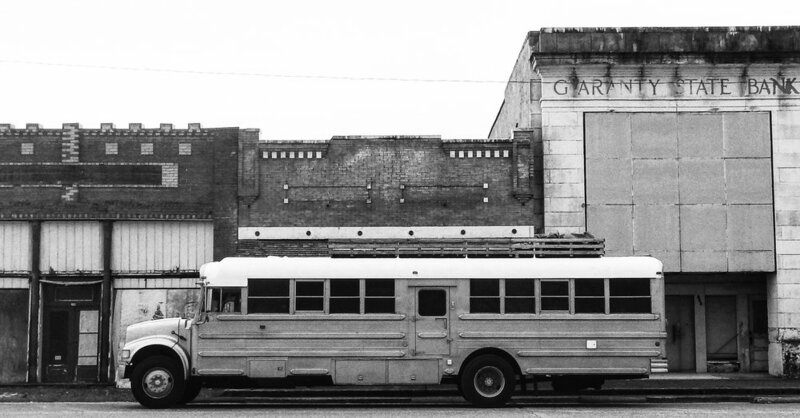 The main thing I wanted to accomplish was for the bus to feel big and as open as possible. Once we tore out all the seats and the ceiling, we realized we had a ton of space to work with. We took blue tape and laid it out on the floor to see where everything might go. The bus is roughly 34 feet long, and has 11 windows on one side, an 10 windows with a emergency exit door on the other. A total of 189 square feet. Buying a bus, I wanted all of the windows to be open, covering them as little as possible. The only window that is completely boarded up is the one for the shower, to fully seal it. 3 are inside of the storage/closet, but allow light in. Otherwise they are all open and available. Describing the interior, I talk about it in terms of windows. The back of the bus is the bedroom with a queen bed and storage, which is 2 windows long/wide. The closet on one side covers 3 windows. The kitchen and fridge take up 3 windows. The couch is 3 windows long. The dinning room takes up 3 windows on the opposite side, the sink is 1 window wide, and the bathroom spans 2 windows. Next came up wiring and plumbing. How and where could we run these things? From there, we realized that the plumbing would interfere with the wheel well, so we had to get creative in mounting the tanks and running the plumbing. The bathroom could only go where it currently is, so we were limited in that aspect. From there I knew I wanted a small dining area, and a couch long enough for me to sleep straight (I'm 6'2"). 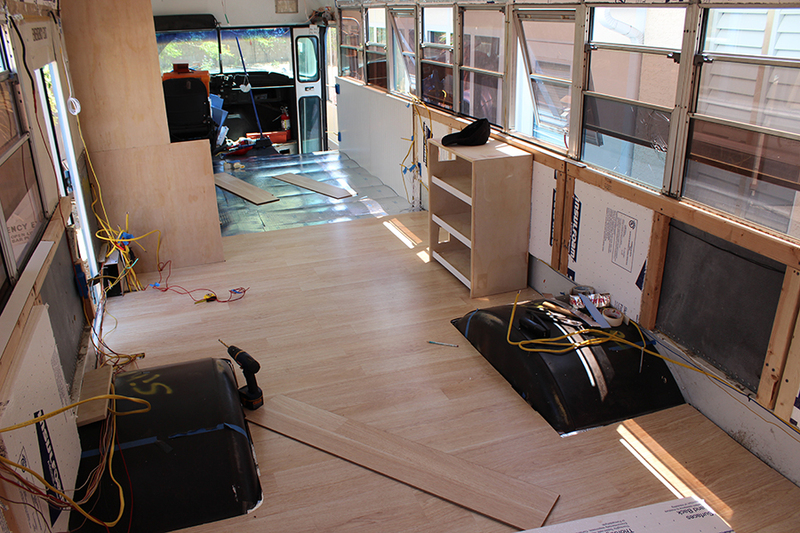 Then thinking about cooking, a fridge, storage/closet space, it amounted to what the bus currently is. Hope that clears up how and why the interior is what it is. Comment below if you have any other questions.